Tanja Golja is a Senior Lecturer and researcher in design education and educational design, with a special interest in transdisciplinary learning and research approaches. 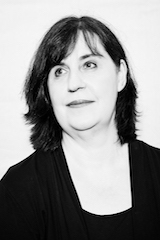 As part of her previous responsibility as an academic developer within the Institute for Interactive Media and Learning, she has worked closely with academic staff in the Faculty of Design, Architecture and Building, collaboratively seeking to enhance the Faculty’s design and successful provision of rich learning opportunities for students within the designing disciplines. Between 2010 and 2013, she was seconded to work full time on the UTS’s $1 billion Campus Master Plan, working collaboratively with cutting-edge architectural firms to realize educational aspirations for the design of formal and informal learning and teaching spaces. She has led and developed the design of a cutting-edge suite of undergraduate double-degree and postgraduate courses - the Bachelor of Creative Intelligence and Innovation, and the Master of Data Science and Innovation - with a multi-disciplinary academic team. Currently, her educational design leadership is similarly generating four new course proposals for offering in 2017. Golja, T & Schaverien, L 2015, 'Distilling insights about educational designing from a history of architectural design education', International Journal of Architectonic, Spatial, and Environmental Design, vol. 9, no. 2, pp. 15-34. Historical studies of architectural design education have endeavored to understand the development not only of this interdisciplinary field but also how architects became architects. While these studies supply descriptions about the changing education of architects, our agenda was to distil the key characteristics of educational designs, in different periods and different cultures, that supported the education of architects in the first place. Furthermore, we considered whether this archival study could shed light on the nature and utility of the term "design" for Education. First, we scrutinized a selective history of architectural design education so as to gain insights into the nature of its educational designs. This resulted in distinguishing eight particular facets of education design: from ancient cultures with their emphasis on ensuring traditions were inherited to contemporary environments (often networked and technologically mediated) that nurture students' research investigations. We then examined what could and could not be gleaned about designing from that scrutiny of educational design in this discipline. Whilst much was learned from this historical study, it did not yield clear guidance on designing in (architectural design) education. Distilled findings did however suggest the required character for such an investigation into educational designing. While design researchers use diverse approaches to study designing, non-designers face specific impediments in adopting these research approaches in their quest to gain design knowledge. Recognizing such challenges, this article outlines how an education academic engineered a first-person methodology to investigate the nature of designing. Through undertaking a learner-researcher study in an undergraduate architectural design basics subject, learning about design through learning to design, she tracked her developing design ideas and crystallized a view of architectural designing as a three-phase heuristic for value selection: imagining possibilities, interpreting ideas to form architectural principles and distilling quality. This article concludes by speculating on various research directions arising from this learner-researcher methodology and a view of designing as value selection and, in particular, provoking consideration of how similar developmental data might be collected and analysed for explanatory insights in diverse design and educational contexts. Going beyond the confines of single disciplines is a hallmark of late C20th and C21st knowledge systems. Contemporary biological and ecological reconceptions of Architectural Design, as a complex dynamic system, illustrate such movement. However, this shift is not only of interest for the new transdisciplinary knowledge system it creates. Serendipitously, it might also make possible another fruitful synergy: between Education and Architectural Design - for Education, too, has recently explored a biological substrate to explain and understand learning. This paper arises from a doctoral study that set out to investigate this synergy, asking, in essence, whether Education is a designing discipline. Here, we lay out a potential basis for synergy between the two disciplines, from which the research design and methodology of this doctoral study was derived. We give some brief general insights into the study's preliminary findings insofar as they address the viability of this potential synergy and conclude by exploring the implications for architectural design education that could follow from such a synergy. Higher education institutions undertake a range of approaches to evaluating and making judgments about the quality of their e-learning provision. This paper begins by exploring benchmarking as one current strategy in common use in universities to identify and implement quality practices: from the use of checklists (for example, of best practices and standards) to a more contemporary dynamic systems approach involving continuous cycles of feedback and improvement centred around the learners' experiences of elearning. These practices are influenced by the teachers' design of e-learning and emerging technologies as well as by the institutional and societal contexts in which both learners and teachers operate. We give an account of two major evaluation studies at the University of Technology, Sydney (UTS), utilising a systems approach to investigate the consequences of e-learning, and we inquire into the value of this particular institutional approach for deriving e-learning quality. We use selections from the large dataset to describe and analyse students' and teaching staff's experiences of an e-learning system (LMS) over a two-year period. Our findings reveal that learners' experiences warrant consideration in shaping future e-learning developments at UTS, and that students value e-learning in facilitating their access to education for making choices about their learning and for enabling engagement in collaborative and interactive learning activities, while they also recognise the current constraints on e-learning imposed by the developers of LMS technologies. The capability to design, and thereby shape a culture's ascent over time, might well be one of the most basic characteristics of what it is to be human. Cultures value successful designs; hence the urgency of understanding the principles and practices that underpin design success. One approach to gaining insights into design has been through exploring the processes of proficient, experienced designers, often in comparison with those of novices. However, researchers are beginning to question the worth of such investigations, arguing that they tell proficient designers little more about design than what they already know from their practice. Nor do they give an account of how these so-called experts might develop their design practice over time in response to emerging needs, pressures or opportunities, for example, so as to design sustainably, in circumstances of resource shortage or with new technologies. Moreover, such studies risk a far too stark and static a priori dichotomy between novice and expert, simply on the basis of their experience at a point in time, suggesting the need to look more closely at how people might develop their design capability. This paper reports preliminary findings of the first part of a doctoral study by a learner-as-researcher, who sought insights into the nature of design by documenting her own developing learning to design over a university semester in an undergraduate architectural design class. Here, we give a brief account of the first phase of her learning to design as a participating member of this class community. We describe some of the design ideas she generated, her early perceptions of designing in this context and some actions she subsequently took, alongside the developing ideas of other students and in response to teacher critique. We speculate on the power of this approach to understanding designing, including how it might inform the teaching of design and the creation of environments conducive to designing. Golja, T 2016, 'Learning to design for the unknown: educational designing in an undergraduate transdisciplinary setting', International conference on Competence theory, research and practice, Wageningen. Golja, T 2014, 'DESIGNING TRANSDISCIPLINARY PROGRAMS TO DRIVE INNOVATION', ICERI2014: 7TH INTERNATIONAL CONFERENCE OF EDUCATION, RESEARCH AND INNOVATION, International Conference of Education, Research and Innovation, IATED-INT ASSOC TECHNOLOGY EDUCATION A& DEVELOPMENT, Seville, SPAIN, pp. 958-968. There has been a shift in recent times to thinking about learners as active drivers of educational processes despite centuries of vesting control with teachers. Perhaps in a bid to resolve such tension, a strengthening group of educational researchers has recently begun to develop an explicit scholarship around Education as a designing discipline: one in which teachers set up designs to hedge the possibility that students will learn. This paper describes the two-part research design of a doctoral investigation that examines the fruitfulness of designing for Education. In the first study, a learner-as- researcher distilled ideas about designing, by learning to design as a fully participating student in a mainstream undergraduate architectural design subject. Then, in the second study, she tested the educational utility of these insights into designing by working as an academic developer-as-researcher alongside an academic and students in a semester-long postgraduate digital architecture design subject. This investigation squarely addresses the matter of whether Education can be conceived, at core, as a designing discipline: if so, in what respects and if not, why not? Moreover, if its findings suggest this question can be settled in the affirmative, then this investigation will also be significant for its potential to refine an educationally powerful concept of designing, one in which both students and teachers might collaborate actively to enhance learning. A first year undergraduate architectural design subject used a studio-based project - designing an innovative and spectacular weekender - as a means by which to introduce students to 'the conceptual and imaginative process in architectural designing.' The client presented her brief, giving insights into her lifestyle, intentions, hopes, requirements and anticipated uses for the building. Then, at intervals during the semester, a subject tutor, the client herself, and a critic provided students with three different sets of feedback on their developing designs. We begin this paper by detailing the client's brief for her building. Then, from the perspectives of a learner-as-researcher (first author, TG), we describe and analyse the form and substance of client feedback on the two conceptual designs each student in the studio generated, reporting how this student (TG) used this diverse feedback to guide the development of her specific design ideas and to seek insights into designing more generally. Finally, we pit this data, in a preliminary way, against the teaching academic's/tutor's provocation to consider design as a problem-solving activity and a brief as leading designers towards a solution. We conclude speculatively, suggesting how this analysis might spur a more detailed research investigation of the educative significance of this studio-based project, within its class community, thereby helping to grow an understanding of designing. Towards a mapping of the field of e-learning New Search Print Abstract E-mail Abstract Full Text Add To Binder Export Citation Related Papers Alexander, S., Harper, C., Anderson, T., Golja, T., Lowe, D., McLaughlan, R., Schaverien, L. & Thompson, D. (2006). Towards a mapping of the field of e-learning. In Proceedings of World Conference on Educational Multimedia, Hypermedia and Telecommunications 2006 (pp. 1636-1642). Chesapeake, VA: AACE. Conference Information World Conference on Educational Multimedia, Hypermedia and Telecommunications (EDMEDIA) 2006 June 2006 AACE Table of Contents Authors Shirley Alexander, Carly Harper, Theresa Anderson, Tanja Golja, David Lowe, Robert McLaughlan, Lyn Schaverien, Darrall Thompson, University of Technology Sydney, Australia Abstract This paper addresses perceptions that e-learning research is repetitive, technologically determined and avoids the difficult questions. A total of 107 papers from two conferences, one Australasian and the other American were analysed, using a framework which posed the following four questions. What questions are being asked? What theoretical positions are being taken? What counts as evidence in answering those questions? What is the educational significance of what has been found? There was clear evidence of varied approaches to undertaking e-learning research. The nature of the research questions reported support the view that there is a degree of repetition in current research projects, and a reluctance to tackle the big issues. The authors recommend that researchers move away from narrowly focused questions to an approach focused on the systems nature of student learning. There is increasing recognition of the need to rethink academic professional development, to shift it from industrial-era craft-based approaches to approaches more in tune with the complex, multi-faceted demands of contemporary higher education. We describe and analyse the learning of a group of three academics over a series of six audio taped conversations. Participants appeared to refine, by means of selection over time, the ways they categorised or carved up their world. Our findings suggest the potency of reconceiving professional development generatively, in terms of a biologically based selectionist theory of learning. We discuss the need for follow-up investigations of the extent to which these academics' regenerated ideas inform their professional practice.